Isamu Noguchi (1904-1988), a Zen-influenced modernist, is considered to be one of the most important American sculptors and designers of the twentieth century. 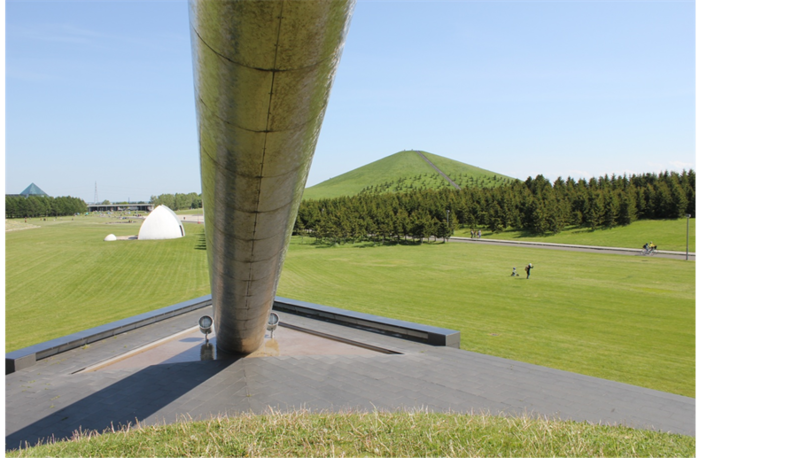 Moerenuma Park in Sapporo (Hokkaido, Japan, completed in 2005) can be justifiably regarded as both the summation of his prior work and his swan song. In this analysis of Moerenuma Park, various aesthetic, architectural, design, and social-psychological matters are addressed. Particular attention is devoted to Noguchi’s care about the social aspects of use by visitors of the most important architectural object in Moerenuma Park, the Glass Pyramid. A comparative reference is tentatively made in this regard to I. M. Pei’s Pyramid at the Louvre (1989). “The highly individualistic, restless wanderer between cultures, disciplines, and countries…” (Posch, 2007: p. 9) ―similar descriptions have been offered by many who wrote about Isamu Noguchi (1904-1988)1. There have been numerous accounts of this Zen-influenced modernist’s life and work (Ashton, 1992; Duus, 2004; Goulandris Foundation, 2010; Herrera, 2015; Hunter, 1978; Lyford, 2013; Torres, 2000; Wolf, 2010) , which clearly stems not merely from his status as perhaps the greatest American sculptor of the 20th century (e.g., Jones, 1988 , quoting J. Russell of the Whitney Museum, and W. Wilson, N.Y. Times art critic; Herrera, 2015, quoting A. B. Glimcher, founder of the Pace Gallery on the 57th St. in Manhattan, and Hilton Kramer, a renowned N.Y. Times art critic), but from a unique constellation of at least three other factors. One of them is Noguchi’s remarkable artistic versatility beyond, or intricately extended from, sculpture (itself in every conceivable material): Broadway stage sets; industrial design (lamps, furniture, decorative items); ceramics; sophisticated playground equipment; foyers; murals; fountains; stone and water gardens. Another is Noguchi’s complex web of intellectual ties with artists as diverse as Constantin Brancusi, R. Buckminster Fuller, Archile Gorky, Martha Graham, Tange Kenzo, Louis Kahn, Kenmochi Isamu, and Shoji Sadao, among numerous others in a long life on two continents. The third factor is the fascination and frank sympathy in the eyes of many artists and institutions on both sides of the Pacific, as well as in Europe, by the fact that the central period of Noguchi’s life of “double ethnicity”, 1935-1955, coincided with the extremely tumultous, to say the least, relations between the United States and Japan2. The present article, however, will not go over the ground that has been well covered by others, for the most part, especially certain biographical and personal issues. Instead, this article’s main purpose is to draw attention to the aesthetic and social-psychological aspects of Moerenuma Park (Moerenuma kōen), which―one can justifiably claim―is Isamu Noguchi’s chef-d’oeuvre, a culmination and summary of his lifelong artistic efforts. The park, on the north-east outskirts of Sapporo, the beautiful capital city of the northernmost Japanese island of Hokkaido, is a vast undertaking (189 hectares; “Moerenuma Park”, n.d.-a ). It is Noguchi’s biggest project by far and his last. The area originally consisted of marshes surrounded by a small meandering river, Fushiko, previously a branch of Toyohira River. (“Moere” is derived from “moyre pet,” which in Ainu language means “slow-flowing river,” while “numa” means “marsh” or “swamp” in Japanese.) Marshes first became reclaimed land by being turned into a major waste disposal site, equipped with a treatment facility (Duus, 2004: p. 380; “Moerenuma Park,” n.d.-b) . In the late 1970s, the Sapporo city planners began to view the area as a future part of Sapporo’s extensive greenbelt. Land acquisition began in 1977, followed by dredging and other flood-control measures. It would seem that an elementary plan for the future park’s dimensions was drawn in the early 1980s. Subsequently, in mid-1980s, an offer was made to Isamu Noguchi to design the entire park. Although he had previously never worked on a project of such magnitude, he accepted the offer, almost certainly regarding it as a very ambitious swan song. Nevertheless, he did not visit the site until March of 1988, followed by visits in May and October of that year. Noguchi completed the master plan late in 1988 and, in fact, made a miniature definitive model about six weeks prior to passing away from heart failure in New York City on December 30, 19883. His declared concept was that “the park as a whole be considered a single sculpture”. These words are now used by the city of Sapporo as a motto for Moerenuma Park (“Moerenuma Park,” n.d.-a & n.d.-b) . 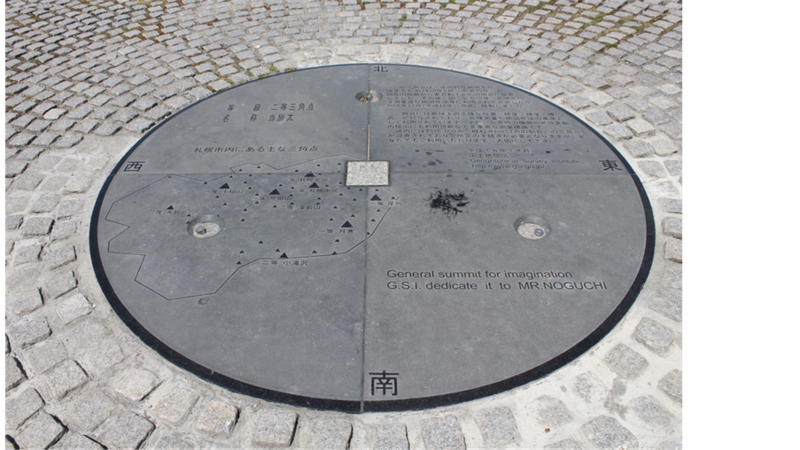 The construction of Moerenuma Park, in accordance with Noguchi’s master plan, began already in 1989. Visitors were permitted to use a section of the park during construction, and there was a “soft opening” in 1998 to commemorate ten years of Noguchi’s passing. The “grand opening” took place on July 1, 2005, accompanied by exhibitions in Sapporo and Tokyo (Museum of Contemporary Art, Sapporo, 2005) . Moerenuma Park is thoughtfully designed in such a way that from each of the four high points―“Mt. Moere”, the apex of the Amphitheater, Play Mountain, and the Glass Pyramid―the visitor has an unobstructed view of the other three. Moreover, since none of the four objects are symetrical in any dimension, it follows that visitors, in walking from one object to another, keep discovering new features of all objects. Throughout Moerenuma Park, and throughout the time spent there, one is aware of harmony, diversification, and complementarity. In Western art, this is usually referred to as unity in variety, which may be what Noguchi’s Zen-inspired pronouncement signifies from a sculptor’s point of view. Like most Zen-influenced sayings, Noguchi’s words that the whole park be viewed as a single sculpture should not be taken literally by a wandering visitor, unless the “single sculpture” concept is translated into Noguchi’s personal touch as a sculptor being evident in all objects in the park―although that, too, is not obvious, especially with regard to the Glass Pyramid (see below). Climbing, by one of three possible routes, including the principal one consisting of 244 tallish stone steps, to the top of the man-made Mt. Moere (at 62 meters above sea level hardly a “mountain” in the international sense, but a common designation for the highest point, regardless of altitude, in Japanese parks), does not reveal, when viewing the layout of the park from this vantage point, a “sculpture” of any kind, including an abstract one. The view of the city of Sapporo and of the mountains west of it (some with snow even in late May) is fine, but that is the minimum one would expect from even a minor landfill elevation in what is, frankly, a rather monotonous flat terrain. What one does see from Mt. Moere, however, are complex and interesting geometric relations. One such is between the line of the stone stairs and the “cross” that is formed by bright, wide, stone paths at their foot, on one hand, and, on the other, the apex that is formed by the meeting, at an acute angle, of two long ascending walls on an expansive grass slope designated as Amphitheater: The apex of the walls is seen as being disturbingly off-center (see Image 1; the exterior of the Amphitheater apex, with Mt. Moere in the background, is in Image 2). Image 1. View NW from Mt. Moere Ó V. J. Konečni. Image 2. Exterior of Amphitheater apex w. Mt. Moere Ó V. J. Konečni. However, what immediately restores an observer’s perceptual comfort is that the asymmetrical positioning of the apex of the Amphitheater (on the left in Image 1) is offset on the right by the combined perceptual “weights” of the pyramidal, 13 meters high, “Tetra Mound” and the pure-white “Music Shell.” This is the balance effect (of which symmetry is only a special case) that has been studied extensively in empirical psychological aesthetics (Konečni, 1997, 2001; Locher, 1996; McManus, Edmondson, & Rodger, 1985) . Noguchi’s park design exemplifies it, whether or not he was conscious of it. There is in the park another man-made hillock, thirty meters high, called Play Mountain. This object is based on the model of a “play mountain” that Noguchi made already in 1933 (Duus, 2004: p. 377; Isamu Noguchi Foundation and Garden Museum, 2007: p. 154) ; there are indications that this object was one that Noguchi had previously most regretted as not having been realized (Duus 2004: p. 377) . On one side, pyramidal in form, the hillock can be climbed by ninety-nine low, widely spaced, steps, whereas on the other, the approach is by means of a wide, gently undulating, stone path (see Image 3 and Image 4). Image 3. Play Mountain from Tetra Mound Ó V. J. Konečni. Image 4. Path to Play Mountain Ó V. J. Konečni. The “summit” can therefore be gained even by very small children walking on their own. The environment of the Play Mountain is friendly and gentle, and the view is pleasing―in short, this is a fine example of an introduction of young children to a combination of natural and man-made aesthetics. The Glass Pyramid is the symbol of Moerenuma Park. It was a first for Noguchi in several ways. He had never before designed a truly architectural object (by most definitions of architecture); the pyramid is of an impressively ambitious physical size; finally, throughout his life in art, Noguchi opposed the aesthetics of putting man first in sculpture, at the expense of nature and environment, yet the Glass Pyramid could be said to be an anomaly both with regard to the above principle and to the rest of Moerenuma Park. It could be described as not belonging at Moerenuma, just as the opponents of I. M. Pei’s glass pyramid at the Louvre claimed for that work. Nevertheless, in the considered opinion of this article’s author, Noguchi’s Glass Pyramid is a fabulous work (see Image 5). Image 5. Glass Pyramid (south end) Ó V. J. Konečni. The Glass Pyramid is at the eastern edge of the park, near the river. Presumably knowing that its unusual overall appearance in all seasons and all times of day would predispose it to becoming the symbol for the entire park, Noguchi intentionally avoided placing the Pyramid in a central location for fear that it would overwhelm other objects (this article’s author’s assumption). Such a choice has one unfortunate aesthetic consequence. The view of the Pyramid from Mt. Moere unavoidably includes nondescript houses, warehouses, and industrial equipment on the opposite side of the river (see Image 6). Image 6. Glass Pyramid from Mt. Moere Ó V. J. Konečni. The approach from the west up a grassy incline is aesthetically quite satisfying, although the silhouette cannot be described as stunning (except with lights switched on within), because the pure pyramidal shape is com- promized by a large rectangular addendum (see Image 7). Image 7. Glass Pyramid, view from NW Ó V. J. Konečni. It would seem that the appreciation of the Pyramid requires the visitor’s proximity, both without and within. The southern glass slope is wonderful to behold closely from the outside, and literally to touch (see Image 8 and Image 9). The intricate glass construction is also very attractive from various exterior and interior angles, and so is the stone base (floor) of the Pyramid (see Image 10 and Image 11). Image 8. Glass Pyramid (south end) Ó V. J. Konečni. Image 9. Glass Pyramid (south end) Ó V. J. Konečni. Image 10. Glass Pyramid interior w. Mt. Moere Ó V. J. Konečni. Image 11. Glass Pyramid base Ó V. J. Konečni. There have been anecdotal remarks to the effect that the Glass Pyramid was Noguchi’s homage to “his friend”, the Chinese-American architect I. M. Pei, who had designed the glass pyramid at the Louvre. Evidence of friendship is difficult to obtain, but it is documented that Pei was present at the opening of Noguchi’s exhibition at Pace Gallery in Manhattan in 1975 (Herrera, 2015: p. 433) , and that Noguchi attended a party on December 31, 1987, in Pei’s apartment in New York City (Duus, 2004: p. 376) . So, at the very least, they are unlikely to have been bitter competitors late in life. In fact, Herrera (2015: p. 495) opines that Noguchi’s “glass pyramid [was] inspired by the one I. M. Pei had built at the Louvre”. However, the evidence for this is also far from conclusive, unless “inspired” is extended to include the motive of being prodded into surpassing. Noguchi’s Glass Pyramid has a very complex design that could not have been created rapidly in 1988, unless he had extensive unacknowledged help, perhaps from Shoji Sadao. The opening of Pei’s glass Pyramide du Louvre in Paris took place in March of 1989, but that design was based on his unrealized, but widely publicized, glass-pyramid project from the early 1970s for the J. F. Kennedy Presidential Library in Massachusetts (Wiseman, 1990: p. 101) . Pei’s primacy with regard to the idea of a prominent contemporary glass pyramid has not been challenged. There is actually in the literature a rather general, and unfortunate, neglect of Noguchi’s Glass Pyramid. Its photographs can indeed be found on numerous web sites―it is very photogenic―but without serious analyses and even its precise dimensions being given4. A combination of reasons may be responsible. First, Noguchi never had the opportunity to provide publicity to the art world. Second, Sapporo and Moerenuma Park have obvious difficulties competing, in terms of both prestige and accessibility, with Paris and Cour Napoléon at the Louvre. Third, there is the above-mentioned issue of chronological primacy. Finally, and perhaps most significantly, there is the question: Is Noguchi’s “imperfect” (“cut-off,” “added-onto,” “incomplete”) pyramid a serious aesthetic rival for Pei’s geometric pyramidal jewel (see Image 7)? Noguchi would have been amply aware of this issue, and the author’s answer to the question will be provided in Section 4. From an aesthetic viewpoint, Tetra Mound and Music Shell (see Images 12-14) are innovative, yet nostalgic, adaptations by Noguchi―for a comprehensive public park―of his lifelong modernist, but original, work in metal and stone5. Image 12. View SW from Play Mt. w. Music Shell & Tetra Mound Ó V.J. Konečni. Image 13. Tetra Mound Ó V J. Konečni. Image 14. Tetra Mound Ó V. J. Konečni. Colorful play equipment at the park, modernist sculptures really, is also mostly borrowed from Noguchi’s many realized and unrealized projects elsewhere. Similarly, the Sea Fountain at Moerenuma, which greatly impresses visitors, especially the young, is a copy of the one Noguchi designed for Bayfront Park in Miami, Florida (1980-1988), where the fountain uses sea water, hence its name ( Herrera, 2015: p. 468 ; a “twinning” agreement was made in 1997 between the two parks). Moerenuma Park’s official brochure’s statement that “the dynamic momentum and flow of water portrays the birth of life and the heavens above,” must be taken with a grain of salt. A parting remark about the aesthetic aspects of Moerenuma Park: There are some three thousand cherry trees in the NE corner of the park, surrounding “Moere Beach” (a wading pool for adults and children). This is Noguchi’s (tongue-in-cheek?) homage to the ancient Chinese highly aestheticized cult of “cherry-blossom viewing,” later adopted by both the old and the contemporary Japanese. It is difficult to think of an architect or sculptor who has shown an awareness matching Noguchi’s of the needs of users of art, broadly defiined, both adults and children. This is only superficially unexpected, given his pronouncements about going beyond man-centered sculpture, and shows how such broad, catchy statements by artists often mean little in practice and in the course of a lifetime in art. Certainly, in the case of numerous design features of Moerenuma Park, Noguchi has shown an exquisite understanding of the social-psychological aspects of people’s engagement with a thoroughly modern park. Many objects at Moerenuma are cleverly designed for multi-use by visitors. As just one minor example, the main purpose of the Music Shell is for dance and music performances to be held in front of it, but its remarkable form conceals not only spacious changing rooms for performers, but also elegant public restrooms. Colloquially, “the proof of the pudding is in the eating”, which here translates into the results of the author’s careful observations of the events in Moerenuma Park over a nine-hour period on a perfect spring day in late May of 2016. The events described below are in addition to the more standard ones taking place on the spacious athletic field, baseball diamond, and tennis courts, as well as the activity of many, but not too many, walkers, cyclists, picnickers, and playing children. Image 15. Top of Mt. Moere Ó V. J. Konečni. Image 16. Conquerors of Mt. Moere Ó V. J. Konečni. Mountain, the author observed a fully equipped man skiing “downhill” on grass. When the man reached the bottom, after some elegantly executed Christiania turns, the author applauded and the skier bowed. In the long winter, the Play Mountain (and Mt. Moere) can be used by skiing novices and by children on sleds. Other parts of the park are available for cross-country skiing. At the Tetra Mound, the author witnessed a couple approaching the mound, the woman taking off her high- heeled shoes, and the man carrying them in one hand and helping the woman with the other up the little slope to the top of the mound. There, under Noguchi’s metal pipes, they solemnly looked at each other, as if making vows. The Tetra Mound may have become a special place for lovers. At the Glass Pyramid, a wedding was in progress (see Image 17). The wedding was not only an example of direct use of the Glass Pyramid for complex social purposes, but also a spectacle for observers standing on upper balconies. Only some twenty minutes after the wedding, three women picnicked on the very same floor of the Pyramid (see Image 18). Image 17. Wedding in Glass Pyramid Ó V. J. Konečni. Image 18. Picnic in Glass Pyramid Ó V. J. Konečni. The space was full of sunshine, as befits its nickname, Hidamari (“Sunny Spot”). In a public-relations gesture, this nickname was chosen in a 2002 contest among 2340 entries. 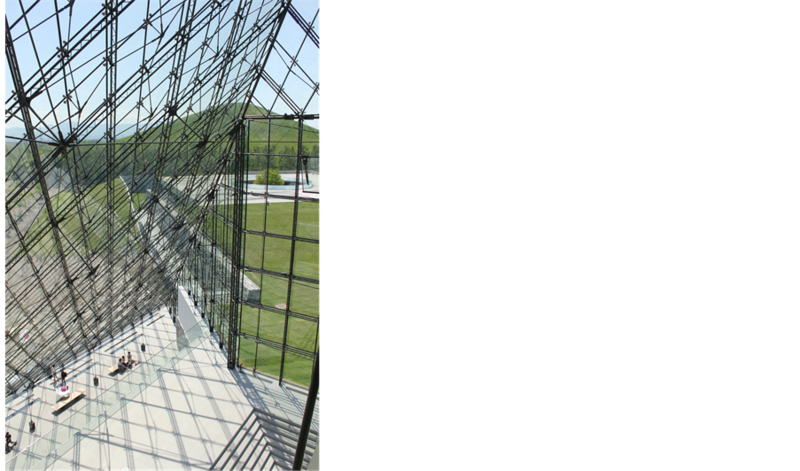 It is perhaps worth mentioning that I. M. Pei’s original glass-pyramid proposal for the Kennedy Library was on the grounds that “it would fill the interior with sunlight,” allegedly representing Kennedy’s administration’s “optimism and hope” (Wiseman, 1990: p. 101) . However, when one looks from the outside at courtyard level at Pei’s Louvre Pyramid, one sees a perfect classical shape devoid of humans. In contrast, when one looks at Noguchi’s Glass Pyramid, one sees a perhaps imperfect pyramidal structure, but one within which ordinary people are enjoying themselves. Whatever Noguchi may have lost at Moerenuma Park in matters of his previously stated aesthetic principles that were allegedly opposed to the overbearing role of man in art, he gained by designing genuinely interactive, user- friendly, art. Such considerations also influence the response to the following reasonable question: Are there any features that one would expect in a comprehensive, multi-faceted park (especially in Japan, but also in China and Korea) that are missing in Moerenuma Park, for example, stone and sculpture gardens? Noguchi created numerous such gardens during his career, and could have certainly replicated one of each or a combined one in Moerenuma. The article’s supposition regarding their absence is again in terms of Noguchi’s desire for close engagement between objects and visitors. A stone garden usually cannot be walked through, nor is it an area for relaxation or play by children. A modernist sculpture garden is usually for viewing, not comfortable immersion. Moreover, a garden with replicas of Noguchi’s sculptures would be too pretentious for a park. So he refrained. Moerenuma Park is a lovingly designed and lavishly executed public space in which nothing is vulgar and there is no charge to enter. Visitors feel welcome and free to roam the vast grounds without obeying any rules other than basic decency. It is almost certain from other evidence that Noguchi contributed to the amiable atmosphere as much as Sapporo’s city planners did. This is a park in which various objects designed by Noguchi, large and small, are exceptionally user-friendly. One has here the operation of sound psychological principles that ought to govern every truly social space―for both adults and children, and for both internal (being-in) and external (looking-at) users (Konečni, 1996) . Visitors to Moerenuma Park are aesthetically engaged with aspects of Noguchi’s Glass Pyramid from many vantage points throughout the park. They can also come very close to the walls to admire the angles and stroke the glass, as well as observe the goings-on inside, such as a wedding in progress. Once inside, there is a multitude of things to do, from visiting a small Noguchi museum to having a picnic. All of this is very different from the experience of visitors to I. M. Pei’s Louvre Pyramid, where those outside observe an empty ethereal glass space, whereas those inside can mostly view it upward. To play its social-engagement role, Noguchi’s pyramid pays the price of having an imperfect shape aesthetically; to be a perfect pyramid, Pei’s work is comparatively devoid of people, except at its bottom. Of course, speaking of I. M. Pei, one must not forget his exceptional ability to marry public use and aesthetic appearance in other projects, such as the Suzhou Museum (Konečni, 2015) . 1. Ashton, D. (1992). Noguchi East and West. New York: Knopf. 2. Goulandris Foundation (2010). Isamu Noguchi between East and West. Turin, Italy: Umberto Allemandi & C.
4. Herrera, H. (2015). Listening to Stone: The Art and Life of Isamu Noguchi. New York: Farrar, Straus and Giroux. 5. Hunter, S. (1978). Isamu Noguchi. New York: Abbeville Press. 6. Isamu Noguchi Foundation and Garden Museum (2007). Design: Isamu Noguchi and Isamu Kenmochi. New York: Five Ties Publishing. 10. Konečni, V. J. (2001). The Golden section in the Structure of 20th-Century Paintings. Rivista di Psicologia dell’Arte, Nuova Serie, 12, 27-42. 14. Lyford, A. (2013). Isamu Noguchi’s Modernism: Negotiating Race, Labor, and Nation, 1930-1950. Berkeley, CA: University of California Press. 18. Museum of Contemporary Art, Sapporo. (2005). Isamu Noguchi: The Exhibition Celebrated the Grand Opening of the Moerenuma Park [Exhibition Catalogue]. Sapporo: Sapporo Cultural Arts Foundation. 19. Posch, K. (2007). Preface. In Isamu Noguchi Foundation and Garden Museum, Design: Isamu Noguchi and Isamu Kenmochi (pp. 10-12). New York: Five Ties Publishing. 20. Torres, A. M. (2000). Isamu Noguchi: A Study of Space. New York: Monacelli Press. 21. Wiseman, C. (1990). I. M. Pei: A Profile in American Architecture. New York: H. N. Abrams. 22. Wolf, A. (2010). On Becoming an Artist: Isamu Noguchi and His Contemporaries, 1922-1960. New York: The Noguchi Museum. 1Noguchi was born in Los Angeles and was called Isamu Gilmour (after his mother Leonie, 1874-1933, an Irish-American writer) until he changed his family name to his Japanese poet father Yonejiro’s (1875-1947) in 1924, at the age of twenty, despite the latter’s lifelong rejection. Moreover, he was educated in Indiana and New York. For these and other reasons, he is generally designated as an American (or Japanese American) artist, so that the order “Noguchi Isamu” is used only occasionally, in East Asia. For similar reasons, I have used the Western name order for Noguchi’s collaborator Shoji Sadao, but not for Japanese artists. 2Not just “coincided”, actually, for Noguchi was personally involved to some extent. In 1942, he voluntarily spent seven months at an internment (“relocation”) camp for the west coast Japanese Americans in Poston, Arizona, with the stated intention of “attempting to mitigate the hardships” of the internees. In 1953, he worked to reverse the official decision not to renew his actress wife Yamaguchi Yoshiko’s (1920-2014) U. S. visa (due to her communist affiliation) (Isamu Noguchi Foundation and Garden Museum, 2007: p. 157, p. 162) . 3According to Herrera (2015: p. 499) , Noguchi showed his final model of Moerenuma Park to guests on November 17, 1988, on the occasion of his 84th birthday, at his home and studio at the village Mure, on the southern Japanese island of Shikoku. 4The height of Pei’s Louvre Pyramid is 21.6 m, and the sides of its square base are given as either 34 m each (“Louvre Pyramid,” n.d.) or 35 m each (Wiseman, 1990: p. 237) in the literature―a significant matter for scholars’ comparisons to the Khufu Pyramid at Giza, calculations of the golden ratio, and so on. On the basis of photographs with human figures, the present author estimates the height of Noguchi’s Glass Pyramid to be about 20 m, which is increased when measured from the central sunken area. 5The relationship of Tetra Mound and Music Shell to each other, and to Play Mountain, is erroneous on the photograph published in Herrera (2015: p. 496) , presumably the result of a left-right reversal in printing the slide.